Hi all! I recently bought ROT3KXI off of Gamefly. I really enjoy how the create-a-character function looks in the game. I also downloaded the portrait editor, and mostly figured that out. So kudos to those that made that possible. My question basically is this: Is there a way to work around the 12 letters max in the name? I've been steadily creating little "bios" for a while now for the major factions of the Italian Wars (1494-1550s.) I've written down all of the principal rulers at the start, some of their generals, and was going to implement them in with the 200 characters we can make. The problem for me is someone like Niccolo Machiavelli's last name is itself 12 characters and I need both a first and last name. And for instance, in 1494 there is a Ferdinand II of Aragon and a Ferdinand II of Naples so I'd like to differentiate by Aragon or Naples (since both are from the House of Trastamara,) but I can't at least name wise. They'd have to both be Ferdinand II. So is there an editor that will let me change the value from 12 to 24 (since both of the name fields will let me type in 12 letters?) Or am I stuck changing Gonzalo de Cordoba to G. Cordoba? So kudos to those that made that possible. My question basically is this: Is there a way to work around the 12 letters max in the name? To my knowledge, there is little you can do to increase that length. As stated in the guide we have 2x12 bytes for the names and 28 bytes (!) of wasted space. If you write something in this unused space, the game won't display it unless you view the bio. 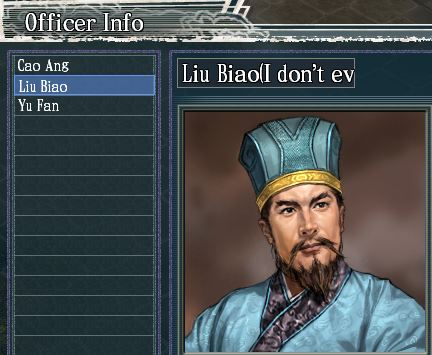 I've made a small test myself and have found that it's only displayed if you use the Officer Info windows, between two parenthesis.